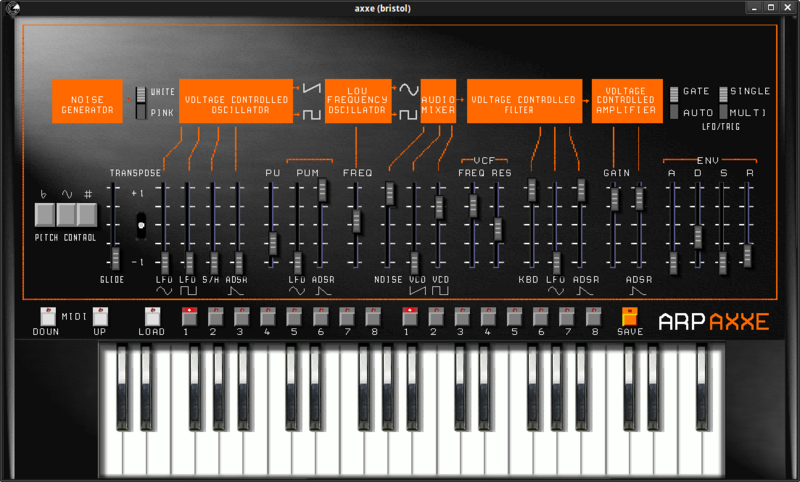 Bristol, created by Nick Copeland, is a software emulator suite for linux that emulates of a variety of vintage synthesizers. The screenshots above show the GUIs of the Moog Memory, Arp Axxe and Oberheim OBXa emulators. Bristol includes about 20 different emulators. The demos above are of the Memory Moog, Minimoog, Arp Axxe and Oberheim OBXa emulators. Bristol is opened from the command line (terminal). Brighton, an additional application found in most repositories, provides the GUIs for easy management of the various knobs and contols unique to each synth. Typing man Bristol in your terminal will give lots of information about Bristol, including the full list of available synth emulations, as well as various additional command-line options for specific performance needs. For example, there are 4 filter "quality" options available which can be chosen depending on the cpu performance of the computer, from "lwf" (lightweight filter) to "hwf" (heavyweight filter). The synths open by default as monophonic, and with a "wwf" (welterweight filter) option unless you specify another. To connect to Jack, include the -jack option. To use polyphony, use the -voices [n] option, where "n" is the number of voices desired. Each synth emulator has, of course, unique features, parameters and capabilities. All of them allow presets to be saved in their respective sections on the GUIs. Be careful to make note of which presets are which, as they utilize numbers only. The Bristol page at Sourceforge provides good, in-depth information about the capabilities of each emulator, including some that are still in development. The webpage also provides audio demos of most synths.